A TD Bank was robbed on January 10. Update: January 23rd, 2014 - The Nassau County Robbery Squad in conjunction with the New York Division of Parole report the arrest of Robert Davidson, 56, of 1030 Arthur Avenue Uniondale. He is charged with Robbery 3rd Degree and Violation of Parole. He will be arraigned in First District Court in Hempstead on Friday, January 24, 2014. DATE AND TIME OF OCCURRENCE: Friday 1/10/14 @ 1415 hrs. 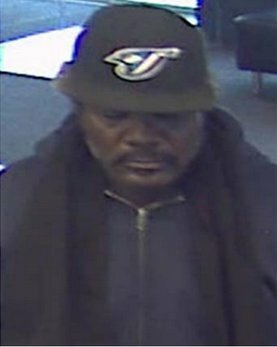 SUSPECT: 1) Male Black 5’10” mid 50s 165 lbs, Blue hooded sweatshirt, blue pants, Toronto Bluejay BB cap black scarf. FURTHER DETAILS: Subject entered the bank, took a bank slip from the counter, wrote out note and then proceeded to victim teller. The subject handed the teller a note stating the subject had a gun. The teller handed the subject an undetermined amount of US Currency. The subject took the cash and then fled on foot Eastbound across Merrick Rd. FOR FURTHER INFORMATION CONTACT: Nassau County Police Department Robbery Squad at 516-573-8040 and refer to Robbery Squad Number 26-14. AUTHORITY: Detective Sergeant John Giambrone, Commanding Officer Robbery Squad. Crime Stoppers is asking anyone who has information about the identity, or whereabouts of the above suspect to call our toll free hotline: 1-800-244-TIPS (8477). Subject: LongIsland.com - Your Name sent you Article details of "NCPD: Rockville Centre Bank Robbed - UPDATE: Suspect Arrested"